Three weeks after being commissioned by Alfred Hitchcock to adapt the novel "The Wreck of the Mary Deare" for the screen, Ernest Lehman was forced to admit that he wasn't the man for the task. Rather than find a new writer, Hitchcock offered Lehman the chance to work on something else; accepting the new commission, the screenwriter conceded that "All I want to do is write the Hitchcock picture to end all Hitchcock pictures." Starting from the director's desire to film a chase scene across the Faces of the Presidents on Mount Rushmore, a convoluted thriller began to take shape: "a real movie movie", as Lehman describes it in the introduction to this volume. The plot revolves around one of Hitchcock's favourite conceits -- mistaken identity. Advertising Executive Roger Thornhill is mistaken for a man named George Kaplan, leading to his abduction and an attempt upon his life. Evading arrest after he is framed for murder, Thornhill pursues Kaplan and attempts to turn the tables upon his attackers. Lehman's first-rate script is sharply written -- with Thornhill retaining his wit even under pressure -- and manages to keep tight control of a complex plot, by rationing the information given both to Thornhill and to the audience. 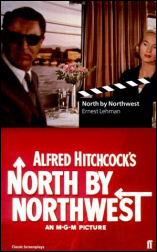 Often cited as a precursor of the modern action movie, "North by Northwest" possesses a charm and sophistication too often lacking in its descendents.